Display hooks like the first one below should really not be used anywhere, because tripping accidents can happen to anyone, but certainly they shouldn't be used low to the ground, where children can easily trip and fall into them. Basically, if the display hook looks like it could be used in a knife fight, it's unsafe. The closed loop hooks are good, as are the hooks with the scanner attachment on the end (so that price and bar code information can be placed there). An investigative report looking at injuries caused by unsafe display hooks. It is a very well done report. Please go take a look. This was originally written late in 2002. 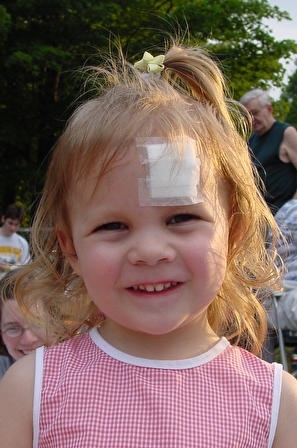 On July 7th, 2002, my 2 year old daughter, Madison, was shopping with her dad at a nearby store when she fell on a pegboard hook. This hook punctured a hole in her skull and entered her brain over an inch and a half. She spent 2 nights in the PICU and 3 days total in the hospital. Several CAT scans and an MRI were performed. She was put to sleep for the MRI so that she would remain still for the test. She was hooked up to a heart monitor, a blood pressure cuff, blood oxygen monitor, and an IV. The doctors would not stitch her head because there was a possibility that they would have to operate to relieve the pressure from the brain bleed. Madison was listless and slept a lot. She vomited for 2 days. When she was released she was instructed to be very careful to avoid any further damage to her head. 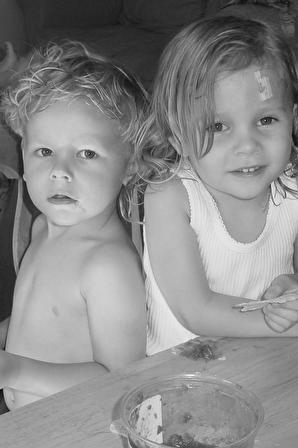 For one month from the date of the accident, she could not ride her bike, go swimming, go to the park or run around with her brother in the house. This was very difficult for her to understand. We were not sure of how things would turn out, but to date Madison is physically healthy despite the damage to her brain. Madison remembers what happened and remembers being in the hospital; she still suffers from the trauma. When she hits her head at all she gets very upset and there are times her and her twin brother Max will "talk" about the incident. I believe this will be one of her very first memories of childhood. Feb 3, 2004: A news story on CBC (Canada) news show "Marketplace" about Justin Maracle and his severe brain injury due to an unsafe hook. According to his mother "It went into him like a butter knife. It entered over the right eye, right through his skull and into his brain." I had a hard time typing that sentence as it strikes so close to home; I hadn't thought about it that way before, but if fairly accurately describes the injury Madison sustained. The old safehooks site had a guestbook for a while, that is, until we had to disable it due to comment spam. I'm putting them here so they aren't lost forever. On December 5, 2002, the local Fox affilate (WJW Cleveland, Ohio) carried a story about Madison and our efforts to eliminate unsafe store display hooks. Please allow time for the clips to download; on a 56k modem, it could take up to 30 minutes. This article first appeared at SmartRisk. of character slippers, which to her looked like stuffed animals. eye. We rushed Katie to emergency at the Children's Hospital. The old safehooks website was beginning to look a little dated, as was some of the content. I've decided to freshen it up a bit. This Drupal powered site should be online and fully functioning in a day or two. We started all of this because our daughter was injured by one of these hooks, and these guys, and everyone else their age, are the reason. It is now our goal to eliminate these hooks from any store where they could potentially injure anyone, but especially children.